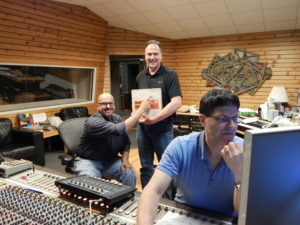 After enjoying a performance one evening Bruce invited the duo to tour the studio. As it turns out, Tom and Rich had recorded at Audio when it was in downtown Cleveland back in 1986. They brought along a 2″ tape from that session, and we transferred the multitrack to digital and remixed it. Turns out that in the original recording Bruce even sang some backup harmonies! We have the ability to transfer audio from a variety of formats. If you have recorded memories that you’d like to preserve or clean up, please give us a call!